This very early and rare triple Irish chain mini-postage stamp chain doll quilt is in fine condition. Minor age spotting in fine condition no tears or damages. This is hand sewn on cotton linen and stretcher frame. Great condition minor age spotting. Amish doll wilt in plexy glass. Very good condition. Miniature hand quilted coverlet either for a baby or doll's bed. Figure of a rabbit mother in front of her house at her washboard while baby rabbit frolics. Vintage "Pineapple Windmill Blades Log Cabin" quilt. Beautiful antique dark pink and white "Birds in Flight" quilt. 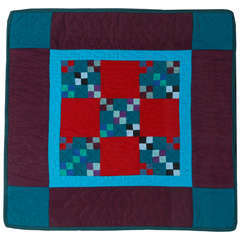 Adorable colorful antique American 'Nine Patch' patchwork quilt.